I like the fact that you used whole wheat flour in this, definitely gives the cookie more texture. Also, your cookie does look like it has some height to it, unlike the typically flat skillet cookies. It does look enticing and delicious in your picture-yum! This looks so delicious. I’ve wanted to get my hands on a cast iron skillet because I feel like it will add a unique crispiness to food, and a giant cookie that’s only slightly crispy on the edges sounds just wonderful. Great pictures! Oh my god that sounds amazing, I love how you made it in a skillet. Looks delicious! I want to eat that cookie. Well, maybe not all of it, but a big fat slice of it. It’s beautiful and it’s in cast iron, which makes it even more beautiful. Hooray for big beautiful cookies! Good for you for knowing where you are with this. I too was fond of the other cookbook though found some of the recipes hard to take/redo. I am intrigued by this new book and the opportunity to learn about some of the recipes of that day. Loved this version of the cookie. You did make it your own. 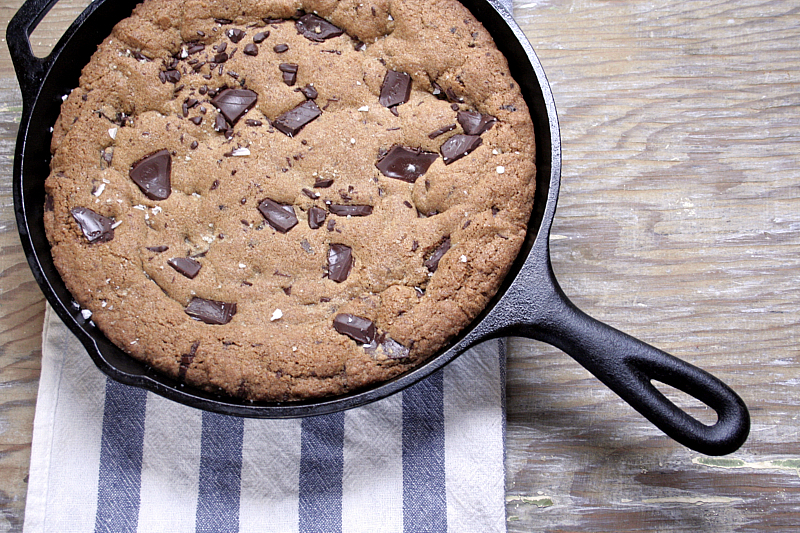 I’d never think to cook a cookie in a skillet! 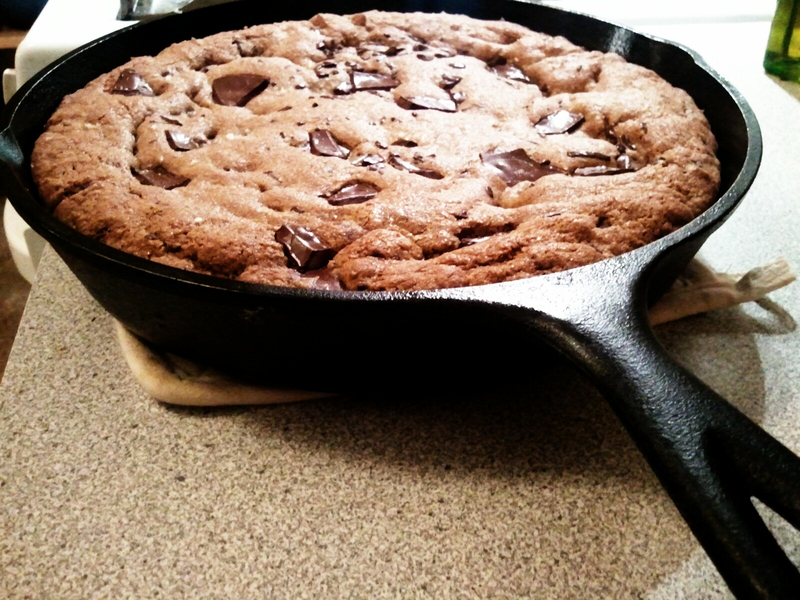 what a tasty cookie that must have been, I’ve never baked in a skillet, I do have to give it a try! thanks for an inspiring entry in this months swap! What a cookie! 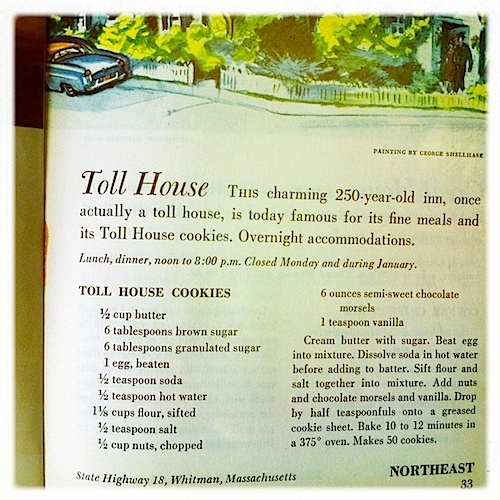 I’m glad you respected your love for the Tollhouse cookie in the swap. I think it’s a perfect recipe for a skillet cookie, too. It gets so puffy by stays dense and moist at the same time! Whole wheat flour is great too. That’s probably the only chocolate chip cookie improvement I make too. I would love to eat this giant cookie right now! Great post! This makes me want to run out and buy a skillet!!! Lindsey, yes! You need a cast iron skillet! It is, hands down, my favorite piece of cookware. Gee! I love how it looks like a sweet omelette on a skillet. I have never had anything like this before…I am so glad I stumbled upon your post. Great cookie post! Thanks! Sigh my happy heart. This recipe makes me feel all warm and cozy inside, and the cast iron skillet seems made for this recipe swap! I have to get a new one (my old roommate blitzed mine, if you can believe it) but there’s something just so wonderful about an old, worn one that I haven’t committed again. I might just so I can make this in the cold of winter for old-moving watching!! Happy Swapping and Happy Holidays over there! Oh I love this!!!!! I need a skillet! What a fabulous idea! There’s something so decadent about one GIANT cookie, isn’t there? And I love the addition of sea salt. A beautiful adaptation!! I love what you did with this swap, the mix of a classic cookie and a classic vehicle to cook it in gives this whole post such a comforting, homey feel to it! This looks amazing – I’m so jealous of your wonderful photography … I had so many issues this month (including a funeral right before posting) which meant that I published without photographs. Hope that you have a very Merry Christmas and a happy new year and I look forward to swapping with you in the new year. Omg this is amazing. I love my cast iron skillet. I’d have to replace the whole wheat though but otherwise this is perfection for me. Love the addition of salt. 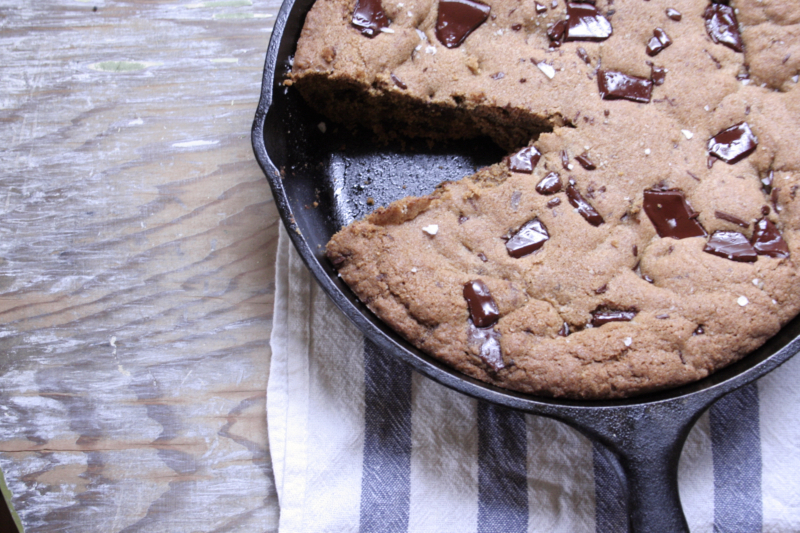 Oh I just love old cookbooks- and this skillet cookie looks fantastic! Applauding your rendition! I would love a thick slice with a scoop of vanilla bean ice cream. Anything in a skillet is better.